Today, we have gathered here to participate in the Jalsa. We do not congregate for any worldly purpose. We come here to partake in this spiritual atmosphere and to enhance our spirituality and intellectual faculties. We improve our religious state and conduct, we adopt the fear of Allah the Almighty and fulfil His rights as well as those of His creation, which have been mentioned by the Promised Messiah (as) in the conditions of Bai’at. Huzur read out some excerpts from the Promised Messiah (as) explaining how religious beliefs effect deeds. The Promised Messiah (as) says that Islam has two components, one is to not associate anything with God. The other is to recognise and fulfil the rights of the creation. Previous peoples were destroyed for committing sins such as adultery, theft, back biting, deceit etc. Muslim Ummah is favoured by God Almighty, which is why He does not destroy it, otherwise Muslims are embroiled in every sin. 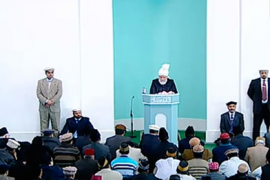 Huzur said that good beliefs lead to good deeds. Having forgotten the true beliefs Muslims have started believing in Dajjal [Antichrist] etc. as their god. Even the governments of many great nations are bowing down to worldly powers and have accepted Dajjal to have Divine powers. Huzur said that the Promised Messiah (as) has said that the purpose of establishing this community is to create an understanding of God Almighty and to attain the essence of worship. Explaining the philosophy of prayer, huzur said that neither prayer, nor worldly efforts are sufficient on their own. Allah the Almighty has commanded for us to make every effort, but to pray as well because the results of our efforts are also created by God Almighty. The Promised Messiah (as) says that true Islam is a combination of both. That is why in the first chapter of the Holy Quran, Surah Al-Fatihah, both have been mentioned. Iyyaka Nabudu [[Thee alone do we worship] refers to the aspect of planning. First, one plans and makes worldly efforts, then he should also pray to Allah. Even the ability to worship is granted by Allah’s Grace and benevolence. Europeans are losing belief in God and atheists are significantly increasing in number. According to the Promised Messiah (as), atheism is a poison that is spreading around the world but God Almighty has sent him to remove this poison. Ahmadis should enlighten the materialists about the existence of God Almighty and inform them about the true Islam. We can recognize the One, True God and get to the apex of worship by following the Holy Quran and by following the practice of the Holy Prophet (Peace be upon him). A strong connection with the Holy Prophet (pbuh) is therefore required. The Promised Messiah (as) says that simply performing the Bai’at is not enough to ensure one’s salvation. One should have sincere faith in one God , the Holy Prophet (pbuh) as a true prophet and the Holy Quran as the last law giving book of God. The Holy Prophet (pbuh) is the Seal of the Prophets. The Promised Messiah clearly says that words Nabi and Rasool used in his books regarding himself certainly do not imply a new Shariah or new injunctions. He says whatever he has acquired is a result of his perfect obedience to the Holy Prophet (pbuh). It is Allah’s practice that when sin becomes prevalent and people do not recognise or love God, He sends someone completely devoted to Him in this world. In his time, even though people recite kalima, the words are empty and perform actions such as worship and fasting, but they are devoid of the true spirit. Thus the promised Messiah has been sent to establish the essence of religion. The Promised Messiah (as) says that actions cannot bring about any benefit unless performed with true sincerity. If there is conflict and ulterior motives, the prayers do not even ascend a single span from the earth as they are devoid of sincerity and spirituality. Regarding the need to establish a new community, the Promised Messiah (as) says the community has been established not by him, but by Allah Himself. God Almighty desired to infuse the spirit of true belief, which had become non-existent and chose to do this through establishing this community. The true purpose of the Promised Messiah (as)’s advent was for us to develop a true relationship with God Almighty, to make us recognise the grandeur of the Holy Prophet (pbuh) and to adhere to the authority of the Holy Quran. Therefore, we need to improve in our faith and also our conduct accordingly. We also need to assess whether our Bai’at is done with its true essence, whether we truly worship the one God without any partner. Some people offer the prayers without the true spirit. Many Ahmadis do not even offer their five daily prayers which this is the most basic duty of an Ahmadi, every Momin and every Muslim. After having entered the Bai’at of the Promised Messiah (as), one should offer their prayers with great zeal and enthusiasm. If someone is not regular in prayers, instead of requesting me for prayers, they should make an effort themselves. When they recite Iyaaka Na’badu Wa Iyaaka Nastaeen [Thee alone do we worship and Thee alone do we implore for help], why do they not recite this from the deep recesses of their hearts and act upon it rather than simply uttering these words? Every action of the Holy Prophet (pbuh) is a blessed example for us. Along with his worship, his high moral qualities are a model for us including his social relations, family relations and with his wives. The Holy Prophet (pbuh) has taught us to take care of wives’ and children’s sentiments. Yet there are many among us who create disorder in their homes. The Holy Prophet (pbuh) also taught us to treat children with compassion and also to generally take care of the feelings and emotions of others. He also taught us against dishonesty and also demonstrated this by his own practise. He always displayed humility and modesty and set high standards of truthfulness. If we truly believe the Holy Prophet (pbuh) to be a true prophet and the Promised Messiah (as) as the Imam of this age who came in his subservience, we must raise the levels of our conduct and the standards of our worship. It is also important to develop a true understanding of the Promised Messiah’s high status and his claim. This era has led mankind away from God Almighty in the name of ‘progress’. It is the duty of an Ahmadi to strive to form a relationship with God Almighty and develop a true understanding of His being. Our love for the Holy Prophet (pbuh) should not be limited to merely a verbal claim or raising slogans but by adhering to his noble example. We must not carry out injustices in his name as the Muslims are doing today. Many organisations and even governments are carrying out injustices in the name of Islam and the Holy Prophet (pbuh). The Holy Prophet (sa) came as a source of mercy for the whole world but due to their actions they have turned his image into one of oppression. They will never succeed in their efforts because the Promised Messiah (as) has appeared and we are continuing our efforts to present the true image of Islam. We must continually follow the noble example of the Holy Prophet (pbuh) in every respect and submit to the authority of the Holy Quran. We must try to ensure that all our actions are righteous actions. We must also strive to distance ourselves from Satan and draw closer to the Gracious God, otherwise as the Promised Messiah (as) stated that our prayers would not ascend to the throne of God. Explaining the truth about the prayer, the Promised Messiah (as) says that it can only be called prayer when the love of God Almighty takes precedence over all worldly desires and one is ready to give up one’s life in Allah’s cause. The Promised Messiah (as) says that many people thought to be believers and righteous are declared as non-believers in the heavens. The true believer and righteous one is he who is declared as such in heaven, even if he is considered a disbeliever in the eyes of the world. Huzur said that the world considers us disbelievers but we are not concerned with it. If our deeds are good and we have a relationship with God Almighty, then God Himself declares us as believers. The Promised Messiah (as) says that it is very difficult to have true faith and display complete devotion to God Almighty. When such faith exists, many signs are manifested. A great sign of true faith among those is that when one shuns all worldliness and distances himself from the world and pleasing God Almighty becomes one’s real objective, one also receives the worldly goods. Allah says: Verily, Allah is with those who have taqwa and do good deeds. Explaining the nature of true virtue, the Promised Messiah (as) says that Taqwa means to avoid the subtle paths of sin, but taqwa isn’t just avoiding the sins and wrongful acts. True piety is that one should serve mankind and show such steadfastness in the path of God as to be ready to sacrifice one’s very life. Merely shunning evil is not enough unless one also performs good deeds. The Promised Messiah says Taqwa is the lowest step, and it can be likened to the cleaning of a utensil before the choicest food can be put in it. Can an empty plate satiate one’s hunger? Of course not! Taqwa is to clean the plate of the Nafs-e-Ammara (the soul that incites to evil).” Thus, to clean the plate, place the food of good deeds on it and to eat it is the real thing which will bring you closer to God Almighty and grant you His pleasure. Huzur said that one of the greatest vices is the sin of lying. The Promised Messiah (as) says that there are thousands of commandments that are not being followed. Some lies are uttered by shopkeepers and others lie for the sake of diplomacy whereas God Almighty has deemed it parallel with filth. Many people exaggerate when describing something and do not even consider it a sin, while others lie when joking. One cannot be called a Siddeeq [truthful] until one does not refrain from all kinds of lies. Another high moral value is to cover up others’ weaknesses. The Promised Messiah (as) says that there are many disputes within the community. The minutest of disagreements are aggravated so much that some people begin to attack the honour of others. When there is a dispute one should admit to one’s error for the sake of reconciliation. One of God Almighty’s names is Sattar (the One Who covers up the other’s faults). Thus man should cover up the faults of his brother and refrain from attacking his brother’s honour and dignity. The Promised Messiah says that another great disease and the root of all arrogance is that if one sees a fault in another person, he announces it to others. All of these matters are part of Taqwah [righteousness]. The Promised Messiah (as) further says that we should adhere to righteousness, only then we will be bestowed with Divine blessings. People who have a tendency of becoming enraged, arrogance, conceit, pride, pretence or fanaticism can derive no benefit from entering into the Bai’at. The Promised Messiah (as) further says righteous individuals are bestowed a Divine awe and others can perceive that they are men of God. The Holy Prophet (pbuh) was the model of all virtuous morals. If one pledges allegiance to the Holy Prophet (pbuh) and also to his servant [i.e. the Promised Messiah (as)] then one must reform oneself. The Promised Messiah (as) has said that one should not highlight the blemishes of others. Many people have a habit of making immoral judgements about their brethren unnecessarily. We should show compassion to fellow men and show kindness to our neighbours, deal with our brothers with piousness and abstain from shirk [associating partners with God], as this is the foundation stone of righteousness. The Promised Messiah (as) explains how one should react upon seeing someone committing a mistake that one should focus on improving one’s own moral condition. They should refrain from quarrelling amongst themselves. If there is a flaw in someone, then we should pray for them instead of publicising their blemishes. We should deal with these as we deal our own children with kindness and gentleness. The promised Messiah said he worried about the faith of those who are ill mannered because bad manners are at the root of arrogance. Thus, we do not have any right to say anything about the others. We should worry about ourselves. About people who are given to anger the Promised Messiah (as) says that rage and wisdom cannot co-exist, so the one who rages in a fit of fury, has a dull mind and brain and does not receive Divine help. He calls rage a form of madness. The Promised Messiah (as) has said that we cannot become recipients to the promises that God Almighty has made with him if we do not get rid of our vices and have a true connection with him. Thus, if someone has these bad habits then it is essential to change them. People attend this Jalsa to become recipients of the prayers of the Promised Messiah (as). But they cannot be recipients of Promised Messiah’s (as) prayers if they don’t change themselves. At Jalsa some youngsters get into altercations and some uphold past grievances leading to bad repute for the jamaat. May Allah Almighty enable us to accomplish these standards and to understand the aim of the Promised Messiah’s (as) Divine mission. May Allah the Almighty enable us to fulfill the purpose of the Promised Messiah’s (as) mission. May He also enables us to inform the world about its truth. During the Jalsa days, you should attend the Jalsa programmes and listen to all the speeches. The tarbiyyat department should try to implement this. Apart from any genuine reason, everyone should be sitting inside the Jalsa Gah. All the attendees of Jalsa should fully cooperate with those on duty whether in the parking areas, scanning, toilets or in the eating areas. Help wherever you can and don’t leave everything to those on duty. Cleanliness is part of faith. Likewise, workers should treat everyone with good manners. Everyone should be mindful of who is around them. This is very important for security. Most importantly, you should focus on prayers. Pray for yourselves, for the Jama’at and for the Muslim Ummah as well that may Allah Almighty grants them wisdom and may they accept the Imam of the Age. Pray that may Allah the Almighty protect it from destruction and may He grant them wisdom and may they be able to recognise God Almighty.